Originally rivals in upstate NY’s rap battle scene during the 90’s, they became partners in rhyme, tagging and production. Already on record as crediting the wider hip hop culture and elements as being the catalyst for them to pick up the mic, US online The ReUp Spot sat down with them recently for their perspective on the evolution of hip hop over the past two decades. The feature is an insightful historical record, as the pair discuss their own involvement in music, graffiti and breakdancing at a time when by comparison to today, the elements had a more prominent and influential role in the wider culture. Subjects addressed act as a historical snapshot of the changes which have taken place. The switch from vinyl to Serato, the elevation of hip hop music, fashions and art elevated from the underground to the broader commercial world, and the emergence of the various sub genres which now exist. Focusing on the new release, they discuss the reasons for collaborating officially for the first time after all these years, their previous solo releases and the impact of signing with Seven 13. 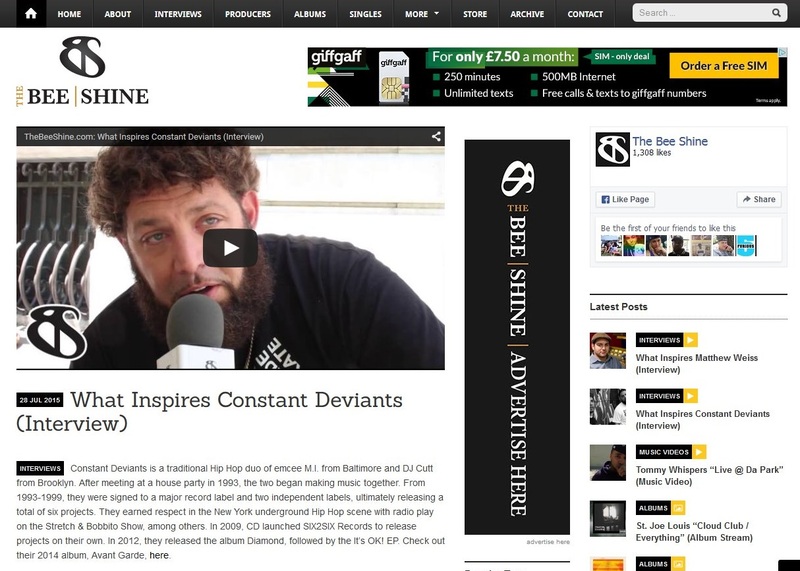 Filmed on 12th May 2015, the actual day of release of their fourth album “Avant Garde”, Constant Deviants sat down with The Beeshine in New York while they were in town for a series of media and radio interviews. For fans of the group, this footage is also a bit of a collectors item as both Emcee M.I…no it’s not DeNiro in Raging Bull ;)…and DJ Cutt discuss a variety subjects from their history, rarer than some of the 12″‘s in Cutt’s crates!!! They talk about their very earliest days getting into music, M.I. explaing his family’s musical background and Cutt reflecting on the days of Red Alert on Kiss and hearing LL Cool J’s “Rock the Bells” for the first time. Moving on to first performing, M.I. recalls the days of hip hop culture first arriving with breakdancin crews and the first freestyle sessions at a record store in Baltimore’s Saratoga Street, while Cutt reveals all about destroying his father’s turntable trying to scratch for the first time, then saving up lunch money to get his first decks….without a mixer…. However it was the progression for both to NY state, with Cutt at school for music engineering that the two met in the 90’s and performed together for the first time at college parties. 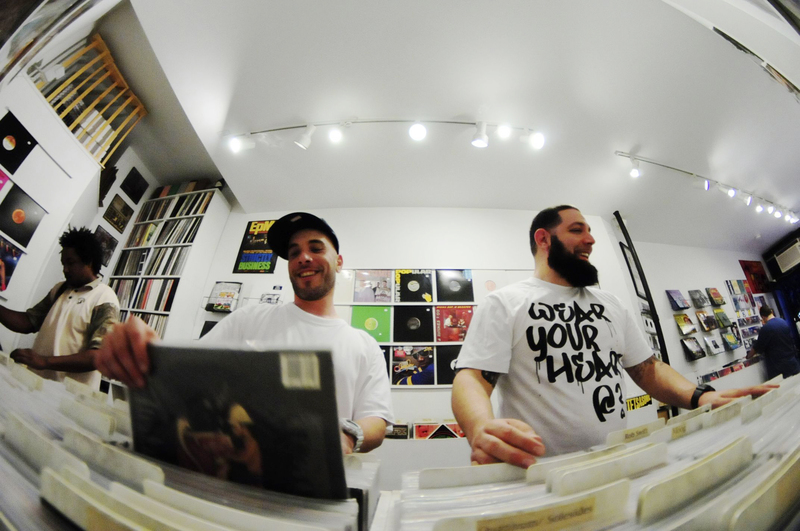 The pivotal point came with the release of their first 12″ Competition Catch Speed Knots, and Cutt reveals he still has a picture of DJ Premier buying a copy at Beat Street. M.I. explains his development from initially a battle rap style delivery to a writer of reality rhymes, and both speak about the benefits they’ve enjoyed of travelling to Europe, learning business skills from the industry and how they’d like to be considered in years to come. 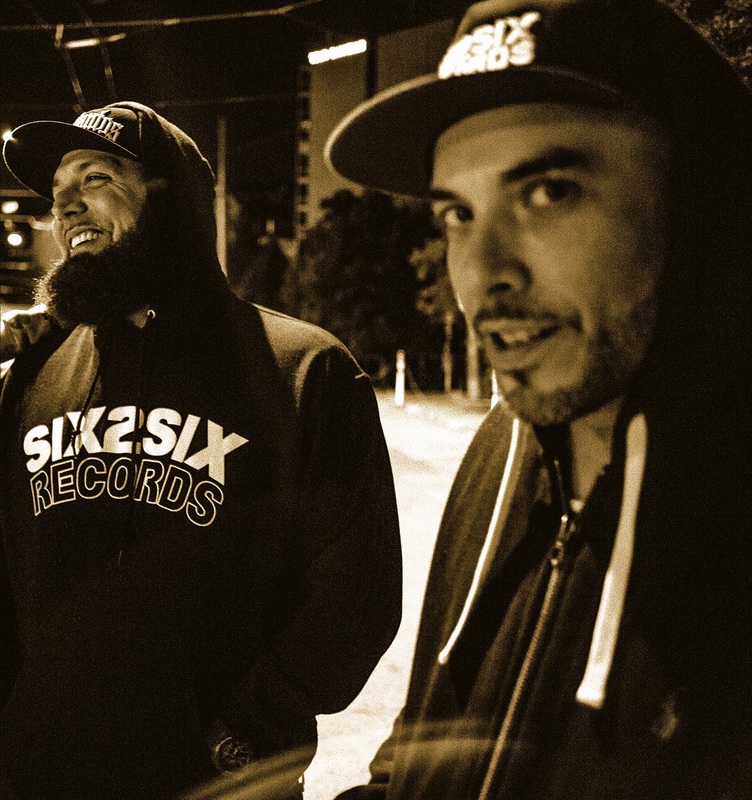 At the time of this interview, they were also guests of Smokin Aces and DJ Bazarro on Beatminerz Radio, and meeting with DJ Evil Dee again after many years ultimately led to Da Beatminerz remixing Constant Deviants most recent single “End All Be All”. Having just returned from New York meeting with media and appearing on stations such as Beatminerz Radio & Not97 / GID Radio, Baltimore’s Emcee M.I. 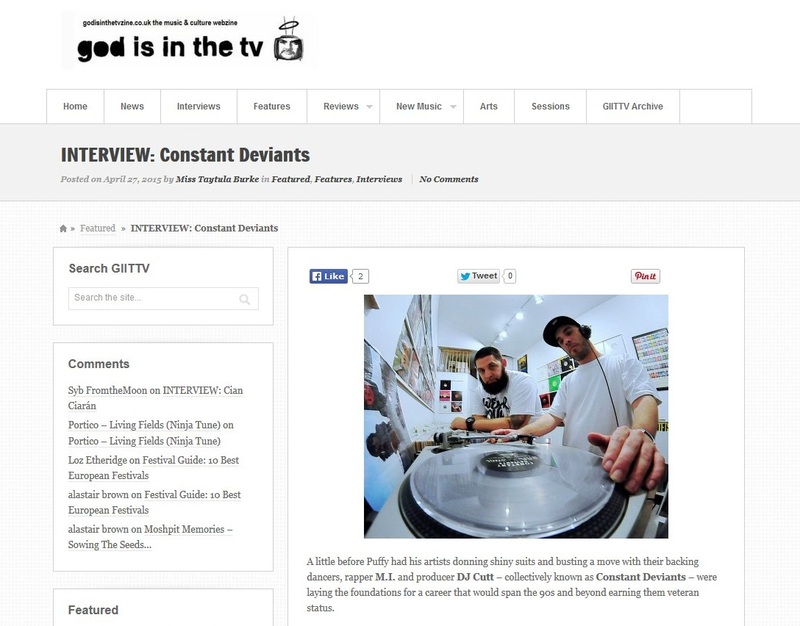 and New Jersey producer DJ Cutt, better known as Constant Deviants, celebrated the release of their fourth studio album in six years this week. The duo are still conducting interviews with various members of the press while also preparing to film a new movie, record a new EP, and in the more immediate future get set to release a new single and the third episode of their popular “3Stylez” video series. Episodes 1 & 2 showing M.I. 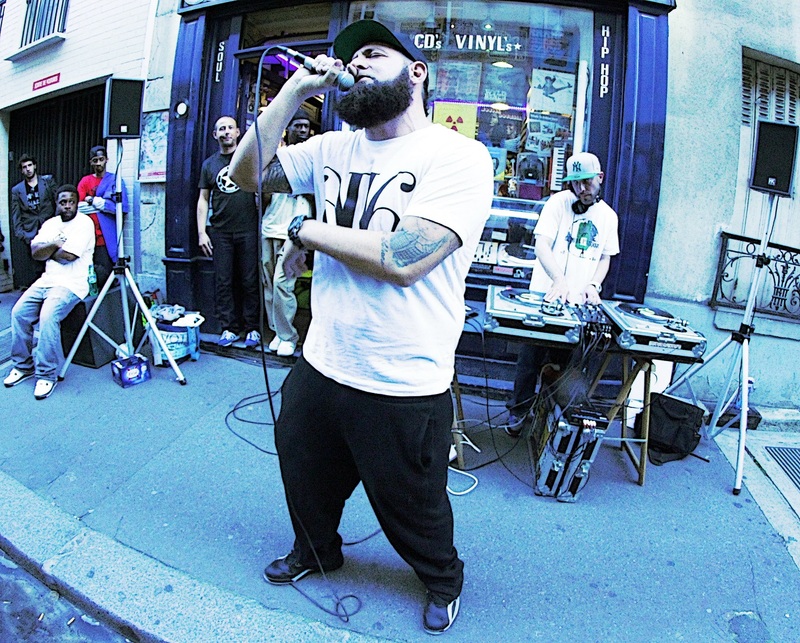 freestyling with DJ Cutt on the decks were released during April. They also dropped a couple of bonus joints recently which don’t appear on any of their albums, but such has been the reaction for dj’s, they may well appear on a future special edition release. “Just Make Music” and “Thinkin” featuring New York MC Rome who is another on the Six2Six roster, are still enjoying a lot of airtime on hip hop shows around the world. 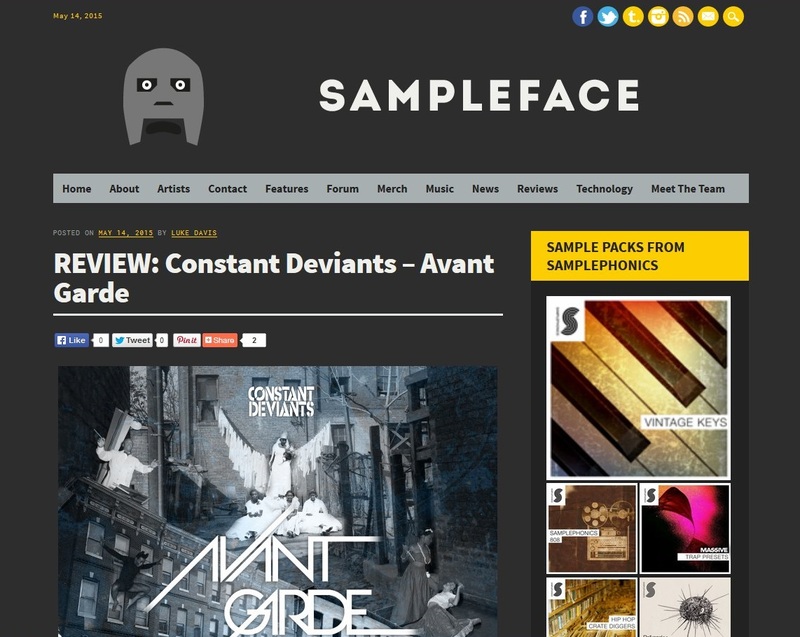 Baltimore & New Jersey duo Constant Deviants release their fourth studio album a fortnight today, on 12th May 2015. There has been much media interest in the group and their new release, especially given their years in the game, their approach to running the label and of course the quality of the album itself. As well as seeing their single “Breathin” be featured in DJ Magazine and reach #1 in the college radio charts, with their bonus cut “Just Make Music” also enjoying a lot of airplay right now, Constant Deviants filmed a trilogy of freestyles, named the “3Stylez Series”. Episodes 1 & 2, “Heavy Artillery” and “Art of War” respectively were launched during April, with the 3rd & final instalment due to be released around the time of the album’s release. 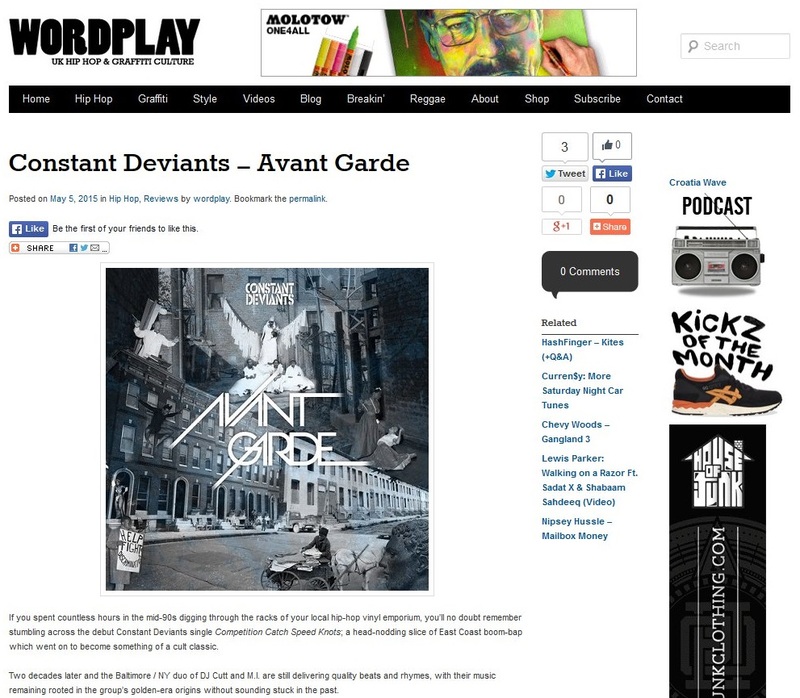 Constant Deviants – 3Stylez Series Episode 2 – "Art of War" from UrbanElite Promotions on Vimeo.